Heading back to downtown again, the “Lofts@SixMileCreek” (no spaces? 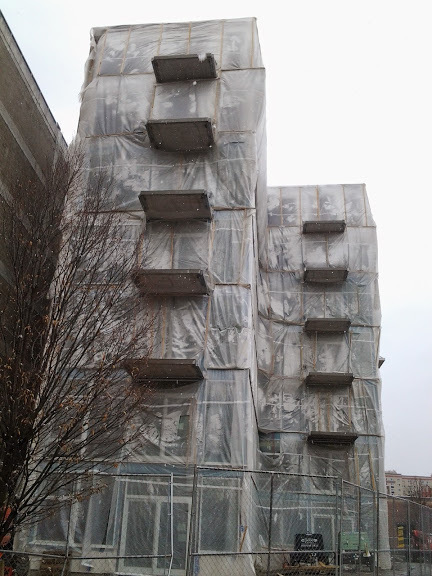 no spaces…) apartment project is plodding away towards its anticipated late summer completion. 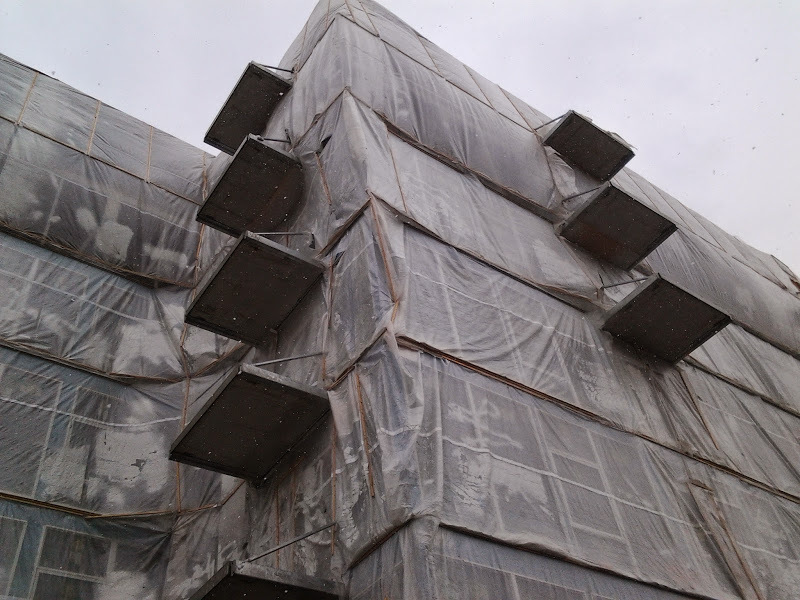 From the outside, there’s been progress under all that protective plastic wrap – the first five floors have had their exterior walls framed and glazed (glass wall installation). The top couple of floors should be sealed up in short order. 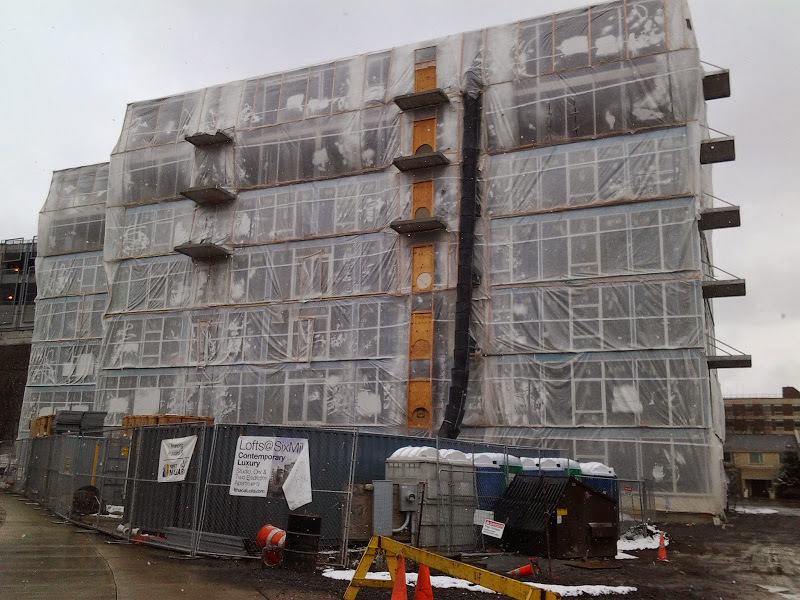 According to an update from Jason at Ithaca Builds from the start of the month, walls and utility rough-in was underway inside the top floors, and drywall hanging and finish-work was beginning on the lowest floors of the apartment building. 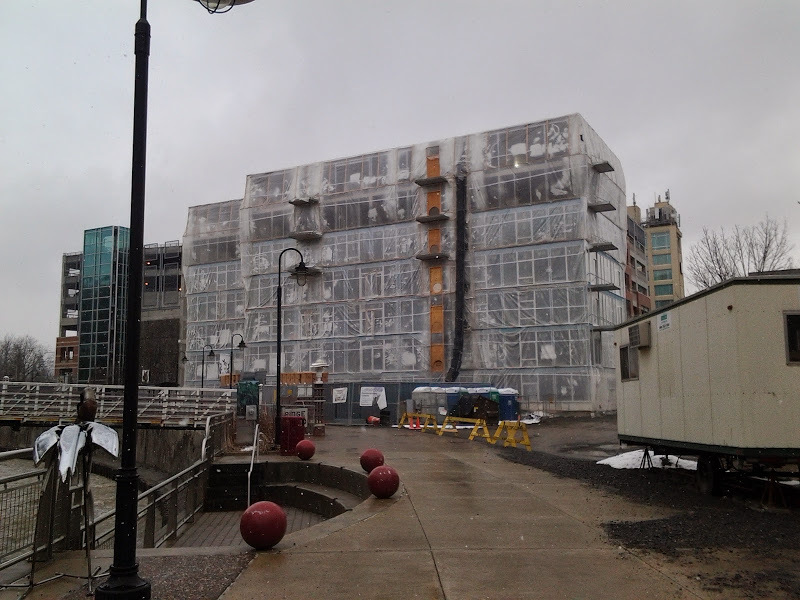 The Downtown Ithaca Alliance recently scheduled visits to the unfinished units as part of its Downtown Living Tour last Saturday. Perhaps the most controversial thing about this project was when the rents were released at the start of the month – prices range from $1,220/month for a studio to $2,655/month for the largest two-bedroom on the upper floors. That got a lot of attention on the Ithaca Voice’s Facebook page, and much of it wasn’t good. Jeff Stein, the Voice’s editor, followed up with an editorial saying that the criticism misses the point, the best way to alleviate the affordable housing crisis is to bring new units to the market at all income levels, which increases competition among landlords. Although I didn’t have a hand in the editorial, I support every word of it. Rents are high for this project, without a doubt. 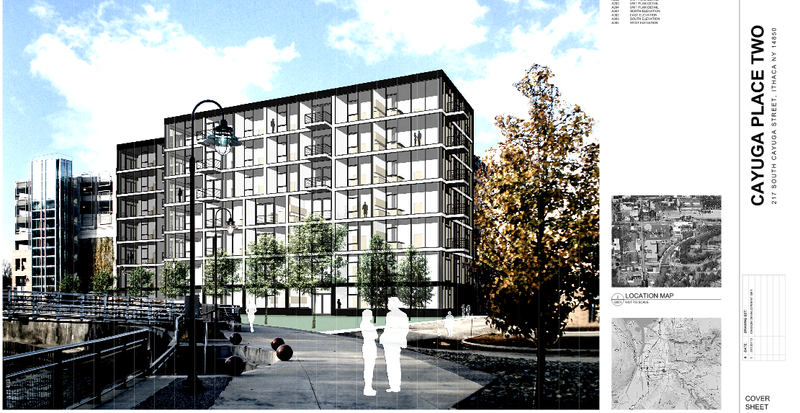 But the city not only needs units specifically for affordable housing, but units that will create competition for Ithaca’s burgeoning renter population. With more units to better satisfy demand, landlords won’t be as able to charge premium prices on subpar units – inferior products will more likely be vacant. There would be a market push for owners to either upgrade their units to maintain a certain price point, or downgrade their prices to more affordable segments. Whether or not Ithaca will ever be able to get to that ideal balance between supply and demand is another story. 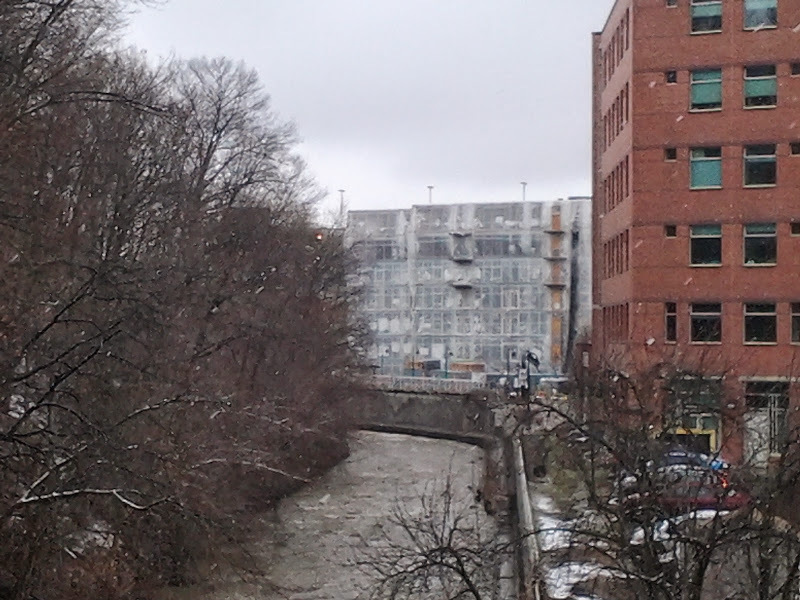 The Lofts at Six Mile Creek project consists of a a 7-story, 49,244 square foot structure that will contain 45 rental apartment units: 3 studios, 21 1-bedroom and 21 2-bedroom units. The building is being developed by Bloomfield/Schon + Partners out of Cincinnati, and construction is being handled by Turnbull-Wahlert Construction, also based in Cincinnati. Were there any tax abatements on this project? I agree that building at all price levels is what might help maker lower priced rentals available in the area, but it really irritates me when I have to pay my property taxes to help these guys make money.